Previously known as the "Teacher Work Center", our newly organized area provides many creative options for you to work on projects. Laminating can lengthen the life of heavily handled materials or serve as a way to preserve old or fragile originals. Lamination material can be written on with dry erase markers or water-based markers and then easily wiped off with a damp cloth for reuse. If you are going to write and erase often we suggest using the 6 mil. film. Items thinner than typing paper may wrinkle when laminated. Items thicker than 1/16 inch will not go through the laminators. The self-serve laminators in The Work Center are 25" wide and are available with both 3 mil and 6 mil lamination film. 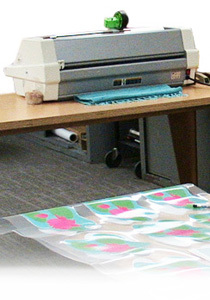 We also have larger laminators in the Printshop that our staff can use to complete your projects. The film for that machine is 37” wide and comes in either 3 mil or 10 mil. Note: We usually have the 3 mil. film on the machine so if you have something that you are wanting done in 10 mil. film please call to schedule a time for your project. such as crayons or thermal paper. • Use rubber cement or spray adhesive to create items to be laminated. Tape, white glue or paste will leave wrinkles. • Don’t use glitter, staples or paper clips on items to be laminated. Envelopes with metal clasps cannot be laminated. Colorful buttons can give your project a creative twist. Ideal for promoting school events, fund raisers, student awards, art projects and more. Teachers and students can produce original artwork for buttons. To get started, follow the simple instructions below. 3. Print or email the file to us for printing. 4. Use The Work Center to create your buttons. Grant Wood Area Education Agency extends equal opportunities in its employment practices, educational programs and services, and does not discriminate on the basis of color, gender, race, national origin, religion, creed, age, sexual orientation, gender identity, marital status, disability, veteran status or as otherwise prohibited by law. If you believe you or your child has been discriminated against or treated unjustly, please contact the Agency’s Equity Coordinator, Maria Cashman, at 319-399-6847 or 800-332-8488, Grant Wood AEA, 4401 Sixth St SW, Cedar Rapids, IA 52404.